There were more than a few expressions of surprise a year ago when Night Flight appeared on a list that I prepared of top 30 Moscow restaurants. “Does Night Flight have a restaurant?” was the usual question. But despite the “Must be Seen to Believe” reputation that follows the nightclub, the separate Night Flight restaurant is one of the best in town. 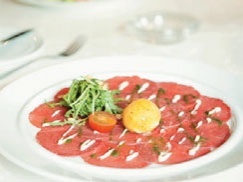 Under Swedish ownership and management for more than 18 years now, the Night Flight restaurant is the place to find elk carpaccio, grilled reindeer steak and genuine Swedish meatballs prepared by Swedish chef Michael Willuhn. At the invitation of manager Toby Domert, Passport publisher John Ortega and I decided to stop by to check out the latest menu. The prominent entrance to Night Flight is on the west side of Tverskaya just south of the boulevard ring. Restaurant guests bypass the 1100 ruble nightclub entrance fee and are ushered to the separate second floor dining, a cozy, open room with big windows overlooking Tverskaya street below. Since the nightclub doesn’t open until 11pm, it’s quiet when we arrive at 6:30 pm. The Swedish business group that owns Night Flight and Scandinavia up the street were invited to open a nightclub in Moscow during the waning days of the Soviet Union. 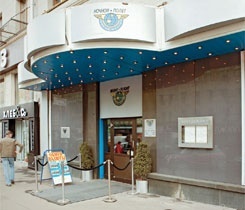 They were shown several possible locations and in October 1991, Night Flight opened in the space formerly occupied by Café Morojhennoye Sever (North Ice Cream Café). Café Sever served delicious ice cream that is still fondly remembered by those who stood in line to get in at the time. 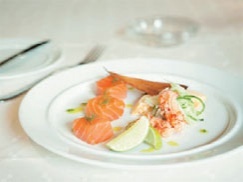 The restaurant opened about a year later, and though still overshadowed by the nightclub, it has served a Swedish-continental menu ever since. 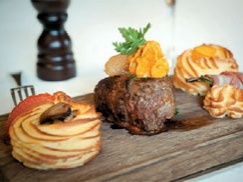 Its classic “Planksteak” fillet of beef served on oak (1400r) has been on the menu since day one. The menu is presented on a large format card with English on one side, Russian on the other. One of the fi rst things we noticed is that virtually all items have three possible serving sizes – “tasting,” “starter,” and “main course” – a great innovation. In addition to Swedish-continental, there are a number of Asian and Russian items listed. 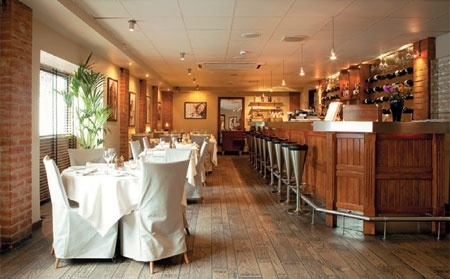 The separate wine list has a broad selection of wines by the glass ranging from an Australian Hardy’s VR Chardonnay at 350 rubles to a California Kendell Jackson Cabernet Sauvignon at 540 rubles. For wines by the bottle, there are about four pages of a global range of wines. Although some are very expensive, there are numerous good wines in the range from 1500 to 3000 rubles. We might recommend the white New Zealand Villa Maria Marlboro Sauvignon Blanc (1990r) or Marco Felluga Pinot Grigio (2800 rubles), or red South African Robertson Winery Shiraz (1520r) or Spanish Beronia Reserve Rioja (which we tried). Though a relative newcomer to Moscow, Chef Willuhn has worked in Russia for about 11 years including six years in Vladivostok. 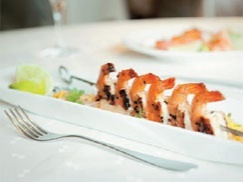 He described Night Flight at a “meat restaurant with experimental starters,” carefully avoiding the trendy “fusion” label. Apparently the Swedish owners source the meat themselves from their home country and ship directly to Night Flight and Scandinavia. We decided to let the chef select our menu for the evening. First out was a selection of three tasters, presented together: Swedish Elk (carpaccio) with Cheese Fritter and Truffle Vinaigrette (250r), Smoked Salmon(250r), and Sashimi Blackened Tuna in Thai Spices with a Truffle Puree (280r). The burgundy disks of near paper thin elk were a pleasant new taste, with a distinctive but not gamey, which nicely contrasted the crisp globe-shaped fritter filled with sharp flavored cheese. Night Flight cold smokes its Norwegian salmon on the premises, and in this case served as a cube bearing a light and pleasant smoke and garnished with a tad of dill. 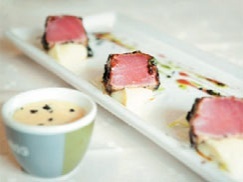 The tuna is rolled in spices before a light sear, very fresh. Next out was a starter of Tiger Shrimp with Mango, Avocado and Glass Noodle (750r), with shrimp presented on a long skewer laid over the spicy, sweet glass noodles. The shrimp were excellent and the noodles, to my taste, pleasantly spiced, sharper than the toned down Asian that is often served in Moscow restaurants to please Russian palettes. The “Planksteak” main course was an ample, very tender chunk of beef laid as promised on a dark wood plank with a dab of sweet ginger and roasted rosettes of potato puree on the side. The steak ranks up there with the best in Moscow. 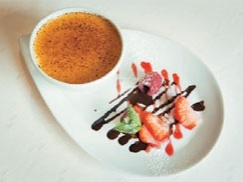 The finale was a tasty if not perfect finish Crème Brule Cacao (290r) garnished with a few fresh berries.